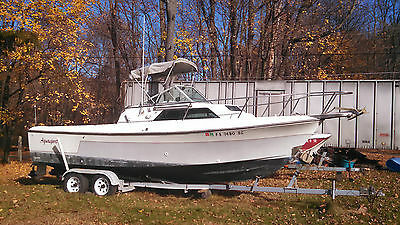 1986 Aquasport 222 express fisherman for sale. It has a 1996 Mercury 250 EFI. It has a hot dipped Galvanized 2 axle trailer, with brand new springs.It comes with T-Top and crows nest, fluorescent lights, GPS/fish finder, Hydraulic steering, two batteries with switches, and trim taps. 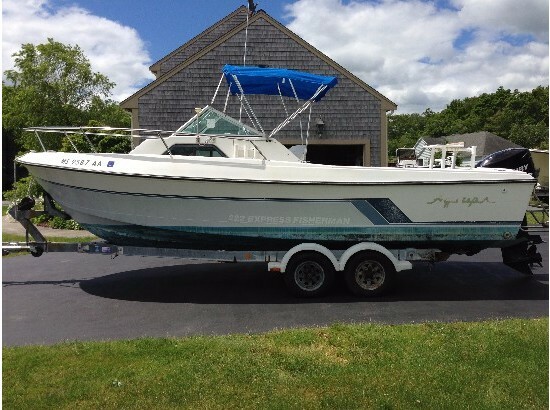 This boat is ready to go fishing/ lobstering in. First $5900. Call Alex 561-358-5334Boat is located in West Palm Beach, Florida only 10 minutes from Palm Beach International Airport. Inspections are welcomed.Priced for quick sale!Florida residents we also collect sales tax plus a $199.00 registration fee. 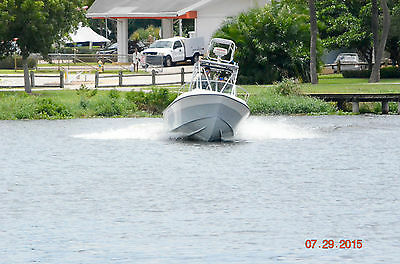 Up for your consideration is a nice 1985 Aquasport Express Fisherman 250 / Twin outboards with a 1981 Calkins Trailer. Hull is in nice condition for its age with some light nicks and scratches and would benefit from a thorough cleaning. I have owned this boat for 4 years. I have never had it in the water. I have been working on it when I had the time, but I have since bought a bigger boat, so this one has to go. My loss is your gain!! Both engines are Johnson 150 VRO's. BOTH ENGINES ARE STANDARD ROTATION. Starboard engine starts and runs and I believe it is a 1985. It idles about 1200-1400 RPM but i feel this will drop to an acceptable idle once it is in the water. I have recently replaced the water pump and 1 of the thermostats. I believe the Port engine is a 1987 and is NOT in top working order. It does start. It's missing spark on the middle cylinders on each bank. I replaced the timer base and the issue was not corrected. I think it may need both CDI power packs and possibly some wiring work and fuel lines replaced. These items are available on eBay. I have just cleaned all carburetors on both engines. When I bought the boat I did compression tests on both engines. All of the cylinders were between 88 and 92 which from what I have read are acceptable results for these engines. I do not know the hours on the engines. I have titles for boat and trailer. It has Hydraulic Steering and the cylinder was just rebuilt 2 years ago. Depthfider, VHF radio, Power inverter, Anchor, and quite a few life jackets are included. Bimini top may requires some repair. A cockpit enclosure is included, but i have never installed it. It may requires some customizing, I am not sure. Interior is in very nice condition and has a sink and an ice box. Trailer seems to be in fair condition. It has a power winch, but I do not have the cables to operate. Overall a nice family fishing boat. In my opinion it will not take much more work/money to be ready for the water. It will need new batteries. Would make a great winter project giving her the TLC she deserves! Feel free to ask questions. I believe in complete honesty and I will answer them the best I can. Thanks for looking!!! Local Pick Up Only. A non-refundable deposit of $300.00 is due within 24 hours of the end of auction. The remaining balance may be paid in Cash or Cashiers Check only. Bidders with 0 feedback must first contact me before bidding or your bid will be deleted. 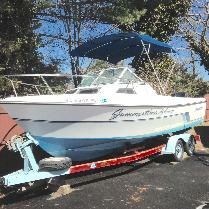 Boat and trailer are being sold As-Is with No Warranty Expressed, Written or Implied. Must be picked up within 7 days of end of auction. 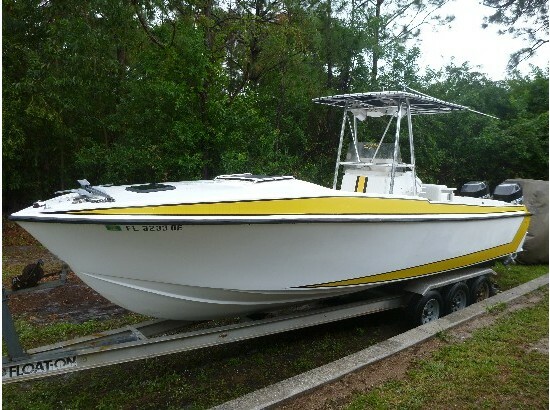 2004 Aquasport 275 Explorer Twin Yamaha F225 2004 Aquasport 275 Explorer with Twin Yamaha 225 hp Four Strokes with only 315 hours. 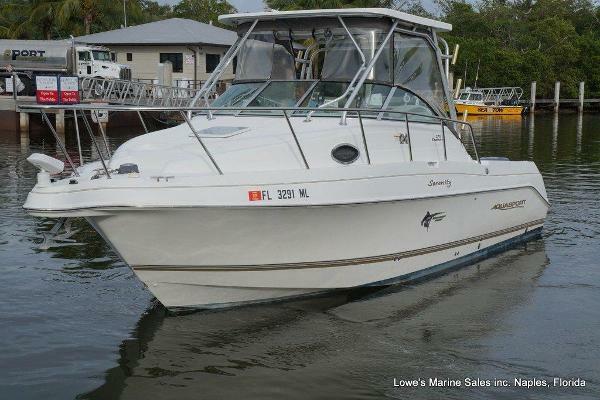 Excellent running and handling express fisherman with family size accommodations. Features include: mid cabin interior with stand up headroom sleeps four, Full Galley, Shorepower, air conditioning, enclosed head with Vacuflush system, Lots of storage, Stereo. 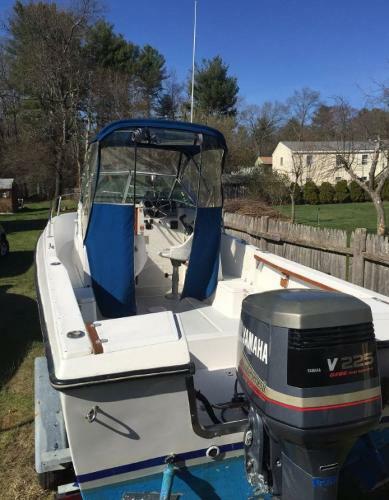 She has a walk-thru windshield, Factory hardtop, three piece curtain set, Anchor windlass, Electronics include a Raymarine color GPS Chartplotter with Fishfinder, VF Radio, trim tabs. This is an excellent handling boat and can take a chop. Cruises nicely at 30 mph and tops out at 45. Trailer not included but is available. 1988 Custom Universal Boats Inc.